Intro – HankFit247 Coach Training Academy! Are you interested in learning more about becoming a Beachbody Coach, but you’re not sure what it’s all about? Join our free training to learn more! It’s 10 days for 10 minutes or less a day! Watch this inspirational transformation video of those who chose to break the cycle and start fresh again with a new, healthier lifestyle! Increase Energy, lose weight, and lower your cholesterol. If you’re feeling tired and sluggish, give yourself a comprehensive inner-body tune-up. In just 21 days, the Ultimate Reset™ can help you gently restore your body to its optimal “factory settings,” to help you have more energy and greater focus, enjoy better digestion, lose weight, and reclaim your overall health. You also get the complete Ultimate Reset Program and Nutrition Guide, two DVDs full of motivation and meal-preparation videos, the Ultimate Reset Caddy to conveniently carry your supplements on the go, and exclusive 24/7 online content including daily cleanse tips, recipes, shopping lists, and support from your Team Beachbody® Coach and fellow Reset participants. This is what is the very best part of Team Beachbody !!! This is the CEO/Owner, Co-Owner, Chief Corporate Attorney, CFO, Corporate officers …. of our 700 Million Dollar Company …. Preparing for a skit to be presented at the Coach Summit in June…. Tony Horton, Chalene Johnson and other Beachbody celebrity trainers and personalities will be involved in the festivities as well !! This company is just plain FUN !!!!!!! The $$ is awesome but the COMMUNITY is what its ALL about !! Can’t wait ’till Summit !!! P90X® Certification is Here! What is it? What does this mean? If you’re a certified personal trainer, fitness instructor or just love P90X, with your P90X Certification, you will now be able to teach P90X in a gym or if you’re a personal trainer, to your clients! If you’re not a fitness instructor of personal trainer, but just love P90X, this certification will give you a more in-depth knowledge about the science behind P90X®. If you liked P90X®, you’ll love our P90X® Certification program. Watch and learn how you can become one of the first P90X® certified trainers in the world. Meghan Lost 109 lbs with ChaLEAN Extreme Watch Meghan’s incredible weight loss transformation story, and find out how Chalene Johnson’s 90-day fitness program, ChaLEAN Extreme, changed her body and her life. I started the P90X in March 2010 at 220.5 pounds and 31.5% body fat. After 90 days of HARD work and resolve, I finished the program at 185.0 pounds and 11.0% body fat. This video tells my story of those 90 days! OK, I’ve been waiting to write this post for quite some time now, because I’m absolutely PUMPED about this. Those of you who know me know I get pretty excited about certain things, and this is definitely one of them! Over just the past few months Beachbody has been rolled out a new promotion, the new Beachbody Challenge. What is the Beachbody Challenge? Well, it’s a number of things I guess, but what it all comes down to is putting groups of 5 people together doing the same program, using the same supplements, and having them all stay accountable to each other, all while having ME as your coach during the entire 30, 60 or 90 days (depending on your program). When I form each group of 5 people, I will create an exclusive Facebook group, and that will be where all 6 of us stay in contact with each other during the entire 30, 60, or 90 day commitment. What makes Challenge Groups so effective? I’ve always been a big believer in challenges because it highly motivates people, and I and everyone else taking part of it always tend to commit ourselves even more when we’re a part of one. When you have a small group, communication is much easier, and you’re able to hold each other accountable and push each other even more than being part of a large group. Plus, there is always some serious competition going on, forcing you to push even harder to achieve better results. When you have competition, encouragement, accountability, and support from 5 other people, it literally is a recipe for success! From the challenges I’ve held in the past, it’s unbelievable the type of results that some people got, and they even mentioned to me that there was no way they could have gotten those results without being part of an exclusive group. If you want to achieve your fitness goals, you’re not going to find a better way than with these challenge groups! How do I join a challenge group? The first thing that you have to do is make me your coach if I’m not already. As you already know (or may not know I guess), it’s free to make me your coach (click here to do so). By making me your coach, you will have constant access to me for questions and support and I will be checking in daily with each challenge group. Next, you have to be using Shakeology and a Beachbody program like P90X, Insanity, TurboFire or one of the other 130+ programs we offer. The reason Shakeology is a requirement is because it serves as your Nutritional Foundation and it’s a product that I’ve been using for about 12 months now, am 100% confident that works, and have recommended to literally everyone I know, including my friends and family. If you want to get the best results possible, you have to be using Shakeology as (weight lose, a meal replacement, typically lunch; weight gain or hard gainers, WITH your breakfast) every day and combine it with a healthy diet and a workout program. I know for a fact that you will get results by doing all of these together, because over the course of 12 months, the ones who have done this have gotten the best results! Beachbody just actually released new Challenge Packs that combine Shakeology, a workout program, a FREE 30 Trial of Club Membership, FREE Shipping at a discount price for purchasing as a bundle. Next, once you purchase a Challenge Pack or reach all the requirements to join a group, email me at HankFit247@LBHank.com, and I will connect you with 4 other people who are going through the same program and have the same goals as you, create an exclusive Facebook group, and then you will get started! What will I need to do once I’m in a Challenge Group? The first thing that you will need to do is share your goals and past struggles with everyone else in the group, including me. Once in the group, you will need to post daily that you’ve completed your workout, followed the diet, and ask any questions or provide support to the other group members. While going through your journey, you’re going to want to make sure you take progress photos every 15 days and post them in the group as well. This way you can show each other that you’re getting results and staying committed! If you want, you can hold certain challenges within your group as well, such as who loses the most weight during the 90 days. Are there any prizes? YES! Beachbody awards $500 daily, $1000 weekly, $1000 monthly, $5000 quarterly, and even a grand prize of $100,000 for those with the best results. Complete your program, submit your results and claim your FREE t-shirt. Plus my TEAM and I award $25 eGift Cards, T-Shirts and DVD’s every 30 days based on your SuperGym calendar. Barry (Power 90) – April 2012 Beachbody Challenge Winner, $1000 CASH! I’m confident that you’re not going to find a better way to get results than you would by being part of a Beachbody Challenge Group! Unlimited support, constant encouragement, friendly competition, and some added prizes will motivate you to commit yourself for the entire 30, 60 or 90 days and get into the best shape of your life . I can’t wait to help you guys reach your goals and again, I can’t tell you how PUMPED I am to get these groups rolling! LET’S DO THIS!!!! I’m such a huge fan of this rule in my life and those that I Coach and train to get themselves healthy – The 80/20 rule! This approach is an excellent way to go about your program and will not only help you see optimal success, but in most cases, will also help to ensure that you stay healthy as you go along as well. Your ears perk up? Sounds like something you can do? But what is it really? Super easy and something YOU can be successful with, let’s just break it down. 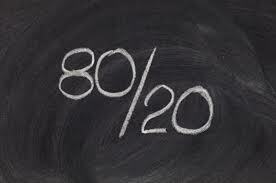 What the 80/20 rule essentially states is that in order to see best success, you should be maintaining your program and nutrition plan 80% of the time, while the other 20% of the time, you can relax on your current regime (sort of). When most people start up on a fat loss diet plan, one of the first things they always want to know is, ‘can I eat X food’? There’s always something that we naturally crave that we simply do not want to give up. Many diets won’t allow it however. They expect you to be 100% perfect at all times. But, who is really 100% perfect in the real world? Or, who wants to be 100% perfect, 100% of the time? You’ll drive yourself mad! Trust me, I’d be doing you a disservice if I led you to believe I was 100% strict and perfect on my diets and workouts, 100% of the time! I certainly have made significant changes, but I’m not perfect either…I’m just human. But here’s the secret….come closer to your screen and read this >>> Giving yourself that leeway – and knowing that 20% of the time you can actually relax on your regime (again, sort of) without guilt will do amazing things for helping you stick with the program. When you adopt this rule, then foods do not become ‘never eat’, they become ‘eat later on’ and ‘less of’. This simple shift in mind frame as you go about your diet is going to make the diet more enjoyable, make you feel more compelled to stick with it, and help to ensure that you maintain a positive relationship with food. As soon as you start putting food on the ‘never eat’ list, that’s when you run the risk of problems coming about with regards to long-term eating behaviors. Let’s avoid that, as it’s simply about changing your relationship with food and how we look to it for sustainability. So to make the 80/20 rule work for you, designate a time throughout the course of your dieting program where you will indulge in your favorite foods. Perhaps it’s one cheat meal each week. Notice I said cheat meal, not cheat day. As, if you have goals, you’ve got to continue focused on the 80%, as cheat days, only allow for your body to be put in a tail spin and eventually spiral out of control and revert back to old habits that perhaps got you to your current state. Right? Think about what will work best for you and then go from there. Perhaps you allow yourself to look forward to enjoying a cheat meal on Saturday evenings. Maybe that’s historically the evening you go out with your spouse, family or entertain with friends. Allow yourself to enjoy that meal and evening without guilt, although keeping your goals in focus. Remember though, that it will be important that you do keep these cheats under control. You aren’t going to see optimal results if you let yourself go on a full out binge once per week. The calories you consume will simply overtake the calorie deficit that you created in most instances. Instead, keep it more moderated. And, realize that the more often you’re cheating, the smaller those cheats need to be. As long as you practice some self-control and stay smart in the approach, there should be no reason why you can’t have some fun with your diet plan 20% of the time and still see amazing results.